Hello there, today is Clearly Besotted release day! yay! I have more on that later but first, I wanted to share my final teaser card with you. 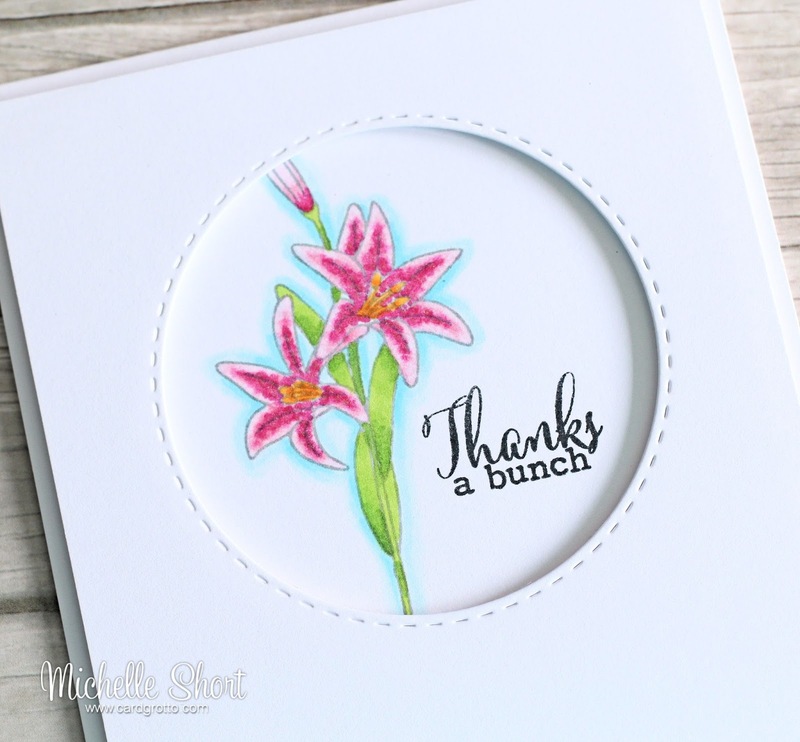 It uses the new Miniature Floral Collection stamp set. If you love flowers, you are going to LOVE this set! You know all the amazing floral images Clearly Besotted have released before? well now you can get them in mini size! 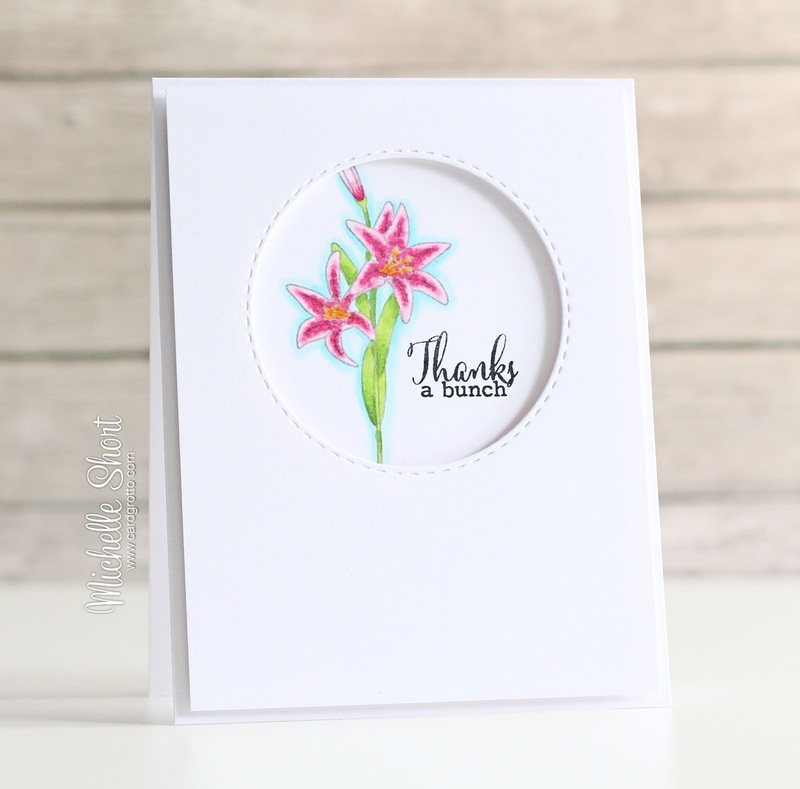 For my card, I started off by taking a white A2 card base and stamping the lily image on it using Memento London Fog ink. The sentiment was stamped beside it using black ink. I then coloured the image using Copic Markers, adding a little sparkle with a Sakura Stardust pen. I then took a piece of white cardstock and ran this through my Cuttlebug using a SSS Stitched Circle die. This made a window in the panel so I could pop it on top of the card and image with foam tape. I love using the SSS Stitched dies for the added stitching on the negative side. COPIC MARKERS: Flower Heads: RV00, RV13, RV17, RV23, RV25, R11, R81, R83. Y17, YR16, Y38. Stems/Leaves: YG17, YG23. Shadow: B0000, B000, B00, B01. There are another two sets that I sadly didn't get time to play with during teaser time. I will share these in my release video later. 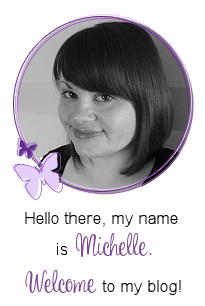 In the mean time please pop over and see Stephanie who will be sharing the full reveal shortly, as well as having links to all the DT and GDT sharing today. Massive thanks goes to our GDT Jo and Cindy, who have been amazing this month. If you fancy having a look at the sets in full, please pop back for my reveal video this afternoon. 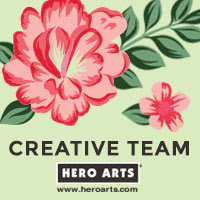 This floral image is very pretty and your colouring is great. I also very much like all your other cards made with the new Clearly Besotted stamps. My "favourites" are the cute animal balloons and those drinks which look so refreshing. This set is one of my favs! Love your card.